A major new report published by the U.K. MS Trust has determined that the country’s National Health Services (NHS) programs relied on by people living with multiple sclerosis (MS) are facing increasing pressures that could lead to inequities in care. Evidence from the Letchworth Garden City, Hertfordshire based MS Trust’s three-year GEMSS evaluation project provides unprecedented insight into the state of MS services at a crucial moment in their development. Collecting data from 16 MS teams who provide services for over 15,000 people living with MS, the GEMSS research demonstrates the vital service provided by MS specialist nurses and the value they deliver, highlighting the challenges they face in providing care. 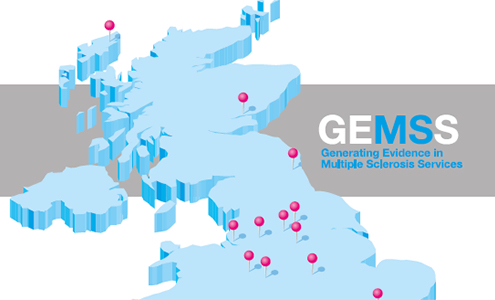 For the GEMSS evaluation projects, the MS Trust worked with MS specialist nurse teams around the U.K. to evaluate their services. The overall final report of this work, together with a report describing and evaluating the process, was published on 10 November 2015. You can download the full report here or the Executive Summary here. An estimated 100,000 people in the U.K. have MS, with around 100 people being newly diagnosed each week. The neurological disorder is three times more common in women than in men and no two people will be affected in the same way. The MS Trust says this unpredictability often presents the greatest challenge to people diagnosed with MS, and to their families and friends. The GEMSS report reveals that people with MS in the U.K. typically rely on their MS specialist nurse for expert knowledge, support and continuing coordinated care, and that patients are more likely to turn to them than to any other health professionals — including neurologists and general practitioner (GPs). Without MS specialist nurses, people with MS say they would have to manage alone, or seek care from overstretched GPs or even hospital A&E (emergency) departments without specialist knowledge and experience, all at an increasing cost to the NHS, making MS specialist nurse cutbacks a false economy for the national health care provider. The GEMSS report data reveal that more and more of MS specialist nurses’ time is being required to support people taking disease modifying drugs (DMDs), and the MS Trust is aware of growing pressure to increase the U.K.’s comparatively low treatment rates. However, they note that half of the people living with MS in the U.K. have progressive forms of the disease and are not eligible for these treatments. Persons with MS have complex and challenging care needs, but with a greater focus being placed on drug management, concerns have arisen that it will be increasingly difficult to deliver equitable service for everyone with MS. The report also reveals that people with MS are finding it hard to access MS education and symptom management courses due to the pressures on specialist nurses time and resources. Training under these programs can help people living with MS self-manage difficult symptoms such as fatigue, pain, bladder and bowel problems, visual disturbances and mobility problems. Building on the work undertaken in the GEMSS program, this Autumn the MS Trust is launching the innovative MS Forward View, a one year project to investigate how MS services can provide greater access to care. Beginning in 2016, the MS Trust says it plans to work with MS nurses, neurologists, allied health professionals, pharmacists and other MS experts to show how MS services can provide greater access to care while making best use of available resources and skills, and still deliver value to the NHS. Meanwhile, the treatment paradigm for relapsing remitting MS (RRMS) is evolving. The 2015 Association of British Neurologists Prescribing Guidelines place greater emphasis on earlier treatment and more rapid escalation of therapy if there is clinical or sub-clinical evidence of disease activity. Published online first 22 June 2015 in the journal Practical Neurology, “The Association of British Neurologists: revised (2015) guidelines for prescribing disease-modifying treatments in multiple sclerosis” (Pract Neurol doi:10.1136/practneurol-2015-001139) have been developed by a team of U.K. neurology experts led by Professor Neil Scolding of the Bristol Institute of Clinical Neurosciences Multiple Sclerosis and Stem Cell Group at Southmead Hospital in Bristol. The coauthors noted that in June 1999, the Association of British Neurologists (ABN) first published guidelines for the use of the licensed MS disease-modifying treatments (at that time, interferon and glatiramer acetate). The guidelines were revised in 2001 and have been periodically updated since then. They say that in 2002, following the negative assessment of these treatments by the National Institute for Health and Care Excellence (NICE), the MS risk-sharing scheme started, in which patients eligible according to the 2001 ABN guidelines were provided with treatment funded through the NHS and monitored annually for up to 10 years. This 2015 revised guideline replaces former versions, includes all newly approved or licensed treatments for MS, and represents a consensus concerning their use. The coauthors noted that these guidelines will require future revision as new treatments receive approval (eg: daclizumab and ocrelizumab), and suggest they be reviewed after an interval of no longer than 12 months. Against a backdrop of overall U.K. treatment rates which are currently lower than international comparators, the MS Trust notes that holistic management of MS symptoms in a multidisciplinary team, and annual reviews for everyone with a diagnosis of MS, are recommended in NICE and Quality Improvement Scotland guidelines. However, they say their research has identified a shortfall of MS nurses and they are aware that there are too few neurologists who specialize in MS, and that the challenge for MS services is how to best use available resources to support the drive for earlier and more intensive levels of treatment for RRMS while still ensuring that everyone with a diagnosis of MS can receive appropriate, timely, high quality care. To that end, the MS Forward View project will bring together clinicians, specialized and local commissioners, professional bodies, experts in workforce planning, multidisciplinary educators, people with MS and the patient organizations, and will produce an action plan to improve and measure access to care, and to help define future education programs for MS care. • Produce an MS Forward View report which sets out a multi-stakeholder action plan to improve access to MS care.